If you're like me you get cravings for fatty greasy junk food occasionally. Well in my case it's actually pretty often, but I do try and resist until I can't take it longer and then I get a cheeseburger. Since I've moved out to the West Coast one of my favorite places to go is In-N-Out for some double double action. 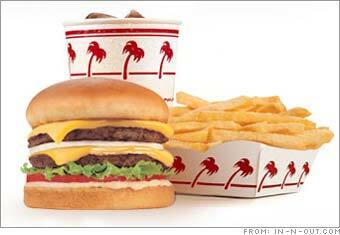 The attraction to In-n-Out is all about it's fresh food with never frozen beef patties and hand cut fries. Most of all the allure of In-n-Out is in the secret menu. My own personal favorite order there off the secret menu is a double double meal protein style and animal style. Code for a double cheeseburger with no bun wrapped in lettuce with grilled onions and secret sauce. All served with fries and a drink. Amazingly delicious and a total indulgence for me. Well the menu is actually not so secret anymore considering everyone orders off it and there have been numerous blog posts about it. In fact In-n-Out acknowledges the secret menu on their official website here. Still there's more to know apparently In-n-Out prints bible references on it's packaging as blogged about by Timbotron over at blogadilla.com. They write about the discreet bible references on the food packaging over at In-n-Out. Next time I go to I have to check out the packaging to see if it's really true. Back to the regularly scheduled program let's talk about that Secret menu! The actual menu only has milkshakes, fries, cheeseburger, hamburger and a double double or double cheeseburger. The secret menu has burgers and fries prepared a variety of ways which are listed here at badmouth.net. The secret menu has sprouted ridiculous feats of gluttony such as the 100x100. That's right 100 patties between two buns. Urban legend? Apparently not says Will(apparently he lives in San Francisco) he blogged about the whole experience here. Insane! Still I'm glad somebody proved this urban legend and that it wasn't me that had to eat all of that. I'll stick to my regular order thank you very much.